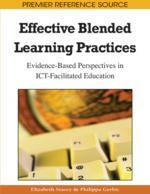 This chapter provides a further two European perspectives on blended learning. The first section is an overview of the ways in which the concept of blended solutions is interpreted in the Italian networkbased education context. Results of research carried out at some Italian Universities about various approaches to technology enhanced learning (TEL) are described which account for an increasing tendency of teachers to choose blended solutions. On the basis of interviews with 250 teachers some important blended solutions sustainability factors are analyzed pertaining to the pedagogical, professional, socio- cultural, informal dimensions as well as the content, organizational, economic and technological. In the second section of the chapter, an overview of blended and personalised learning in the United Kingdom is presented, with a critical review of some of the recent British research into the efficacy of learning management system (LMS) based blended learning approaches. Central to the chapter section is a discussion regarding the future of the LMS and how the network generation is migrating toward social networking sites and mobile technology to connect with their peers. The chapter finishes with the suggestion that personalised learning environments (PLEs) will be their preferred blended learning and communication approach. Research on the educational use of ICT in Italy, has shown how organizational, logistic and economic aspects are often considered as one of the key elements in promoting the sustainability of network-based education (NBE) (Trentin, 2008). However, it is known that to guarantee appreciable quality in NBE, these elements should not precede those more specifically related to the pedagogical dimension of NBE (Seufert and Euler, 2003). Whenever this happens, the choice of pedagogical approach is generally conditioned and channeled towards a NBE based primarily on the individual (and passive) study of educational materials (e-content) (Collins & Van der Wende, 2002; Howell et al., 2004). Despite being usually considered cheaper, content-driven approaches almost always curb the quality of the learning process, since they deprive it of its other important key dimension, namely social interaction (Varis, 2004). If the social dimension of learning is to be fostered in NBE, then the network should not merely be seen as a means of distributing educational materials but also as a resource that is able to facilitate distance interaction with both teachers and other students (Zemsky and Massy, 2004; Attwell, 2005). This result can be obtained by adopting networked collaborative learning (NCL) strategies. The term NCL gives a clear idea of how extensively the computer network is used in the learning process; participants interact in a fully-fledged learning community (formal or informal), which helps them to overcome their isolation and enhances their contribution to the group (Stahl, 2006). In NCL, phases of individual study alternate with remote interaction between one or more virtual classes. This is an approach that combines aspects of traditional distance learning (individual study and possible remote connection with tutors) with substantial interaction between participants (teachers, students and experts), a characteristic typical of face-to-face teaching (Harasim et al., 1995). However, “pure” NCL strategies are not always easy to apply. There are several reasons for this. One is that some subjects are not particularly well suited to network communication. Another is that course participants might not be used to and/or willing to join the particular communication dynamics of courses that are almost entirely based on written interaction. Furthermore, attaining high quality standards of learning often requires time for direct face-to-face social interaction between students and teachers. Integrate formal and informal learning.